I just came across your wonderful handmade art journal, and was wondering if you sell these? I am particularly interested in the Monopoly one. What would one cost, and do you offer a discount if I'd like to purchase several? Thank you very much for your nice note. I'm sorry, but I do not sell these journals...rather, I fill them up as soon as I make them. Mostly I make them as samples for teaching, so if you'd like to make one yourself, I could recommend some good resources to you, starting with my Book Arts page. I don't have a specific tutorial for that exact book, but the techniques can be found in either of the books by Shereen LaPlantz or Alisa Golden, which you'll find listed at the 5th link (books about books) in the list above. 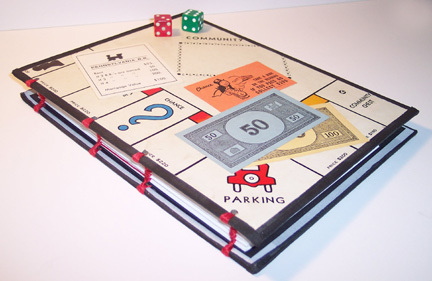 And here's a tutorial for a stab binding style that is really easy to do and would probably work well for your Monopoly journals!